Former president Daniel arap Moi may oppose the withdrawal of a suit against a lawyer who claims he saw him sign a controversial land transaction that has evolved into a protracted dispute in which he appears to have sold the same property to two different buyers, a trial court was told Tuesday. Mr Moi’s lawyer, Fred Ngatia, who was not in court but sent a representative, says he may want to personally comment on the withdrawal of the suit that named lawyer Paul Ndung’u and the firm, Ndung’u Njoroge and Kwach Advocates, as respondents . Then a lawyer at Hamilton, Harrison and Mathews, Mr Ndung’u stated that he witnessed Mr Moi’s signature in the sale of the property to DPS International on November 10, 1988, while he was still president. On Tuesday, the presiding judge, ruled that the suit was marked withdrawn since the civil procedures rules allows the plaintiff to hold sway, meaning Mr Moi cannot stop the withdrawal of the suit against Mr Ndung’u. The suit against Mr Ndung’u was lodged by Dr George Kiongera who first stated he bought the land from Mr Moi at Sh500 million before Equity Bank CEO made the same claims, saying he bought the plot from the former head of State for Sh300 million. Dr Kiongera’s lawyer, Dancun Okatch, confirmed in court that the suit has since been withdrawn after consultations with the parties involved. The judge ruled that the withdrawal would not prejudice any party in the proceedings, but allowed Mr Moi to lodge a formal application to oppose the withdrawal if he so wishes. It was agreed that the motion to oppose the inclusion of Mr Ndung’u and the firm in the proceedings “was technically spent” as it has since been withdrawn by its author, Dr Kiongera. The university is the third claimant having stated it bought it from an insurance company, which had bought it from the DPS International. 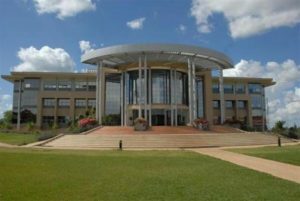 DPS sold the property to the Insurance Company of East Africa (ICEA), which subsequently sold it to the United States International University-Africa (USIU-A). The case will be mentioned on January 18, 2017 for further directions.